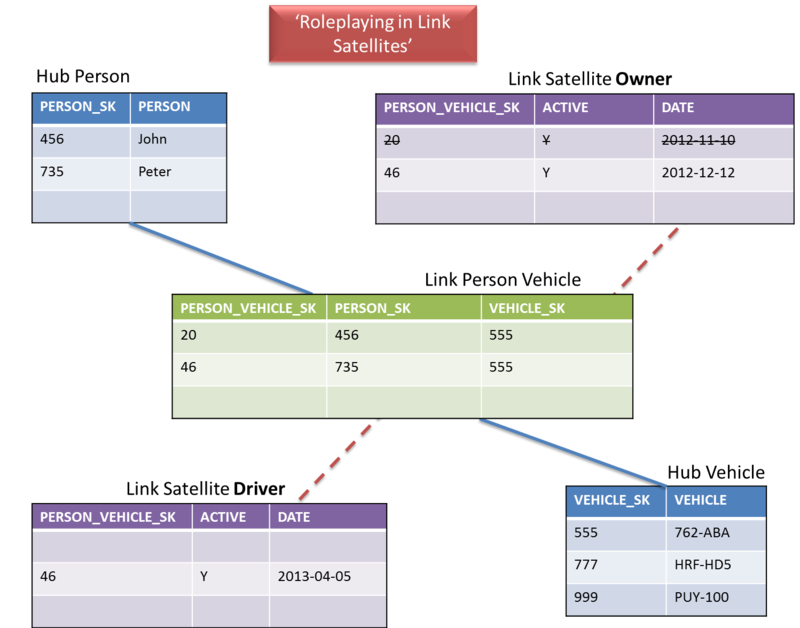 Recently I have been involved in some (very lively) discussions related to implementation of ‘role playing’ in Data Vault. In other words: how to handle (model) different types of relationships. Over the years my response has been that from the perspective of Data Vault modelling it doesn’t really matter if you create multiple Link relationships between Hubs / business entities, or if you create a single relationship with multiple Link Satellites each handling a relationship role. So based on the above, both approaches are practically the same. Personally I have always been using multiple Links to handle relationship types, but I think I have a better explanation now as to why this ultimately is the better solution. To illustrate this I have taken the case of multiple potential relationships between a Person and a Vehicle. For instance the relationship (type) can be ‘driver’ or ‘owner’, because the person who drives a car does not necessarily owns it as well. The example I prepared shows that John owns a Vehicle (with rego ‘762-ABA’) at a point in time, but Peter is driving it. After a while Peter decides to buy the car and thus becomes the owner. 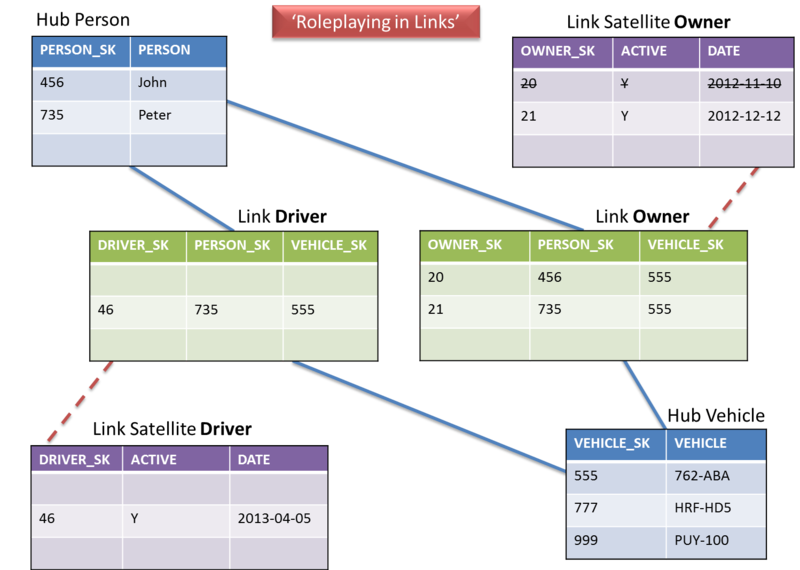 The following images show how this plays out in both approaches towards role playing in Data Vault. This leads to one relationship being closed-off in the Link Satellite Owner. John no longer owns the vehicle, but Peter does now. He is still the driver of the vehicle (as visible in the Link Satellite Driver table). At first the practical result seems to be storing (redundant) Link records, because of the physical separation of the Links. The results / information is exactly the same as with the first scenario. In the end it will cost a bit more disk space, but the model will be clearer for it.